Even the bear is bothered by the hat being worn inappropriately. Interior Secretary Ryan Zinke is a man of pomp, circumstance, and the mountains. He has a big boy flag he makes staff raise when he’s in his office, rode a horse to his first day of work, and calls himself a geologist. I don’t know if you heard, but he also used to be a Navy Seal. It’s all part of an effort to project equal parts decorum and manliness in the mold of Teddy Roosevelt. 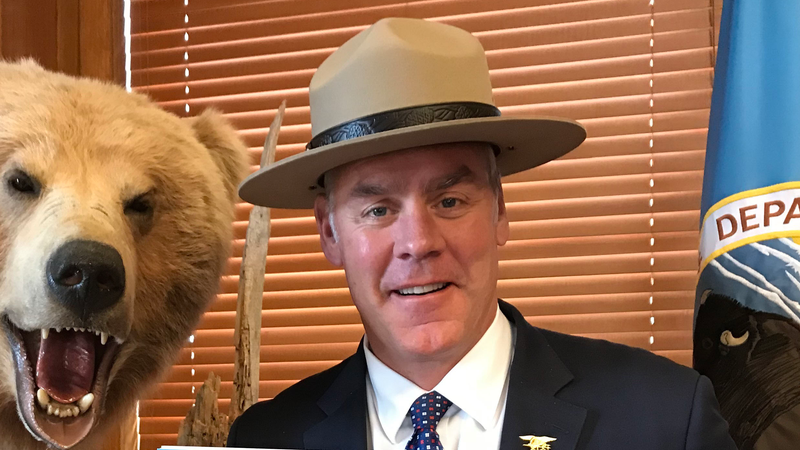 So you would think a simple thing like wearing the famed park ranger flat hat would be easy for Zinke. But no, it is not. Outside Magazine first noticed that in a picture attached to a press release touting a new Junior Ranger passport, Zinke was wearing the iconic hat backwards, with the front-facing “USNPS” label on the hat band clearly not visible. You may also recall the time the publication wrote a profile of Zinke that dragged him for not knowing how to rig a fishing rod. As a former ranger myself, I would have to agree (for the record, here’s a picture of what it looks like worn the right way). I would also point out that it’s also just plain uncomfortable wearing the flat hat backwards. Beyond that, Zinke is in a suit, which is another no no. You should either rock the whole green and gray uniform, or no uniform at all. To Zinke’s credit, the man is doing a good thing, promoting a program to get kids interested in going to parks. I am all for that. And he’s hardly the first politician to play dress up for the cameras. Then again, Zinke has destroyed public land protections, offered up vast swath of wilderness and ocean for drilling, and devalued diversity on his staff. His policies have been wildly unpopular. So yeah, look at this jabroni.